•hxe LONGITUDE OF PERIHELION.ST. 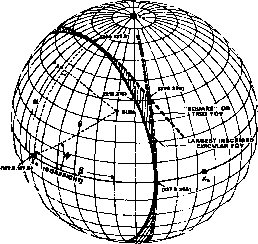 IS MEASURED FROM THE VERNAL EQUINOX; THAT IS, w" il + FROM THE VERNAL EQUINOX EASTWARD TO THE ASCENDING NODE AND w IS THE ARGUMENT OF NODE ALONG THE ORBIT IN THE DIRECTION OF THE PLANETS MOTION TO PERIHELION. 4AT EPOCH SEPTEMBER 23.0.1960.